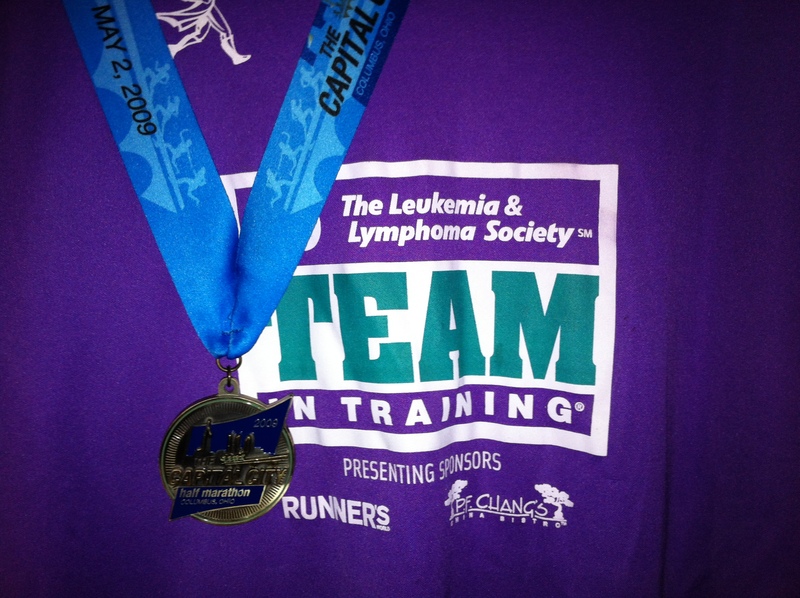 In 2009 I had signed up to run with Team in Training to raise money to find a cure for Lymphoma & Leukemia and support families that battle these terrible blood cancers. Within a month of signing up, my father in-law was diagnosed with NonHodgkins Lymphoma! Of course I made him my hero, the person I was fundraising and running for. Every hill I tackled during training became nothing. Because compared to what Roger was going through, what was a hill that I needed to overcome? With the help of my employer and some very generous people, I was able to raise a good amount of money. Enough to receive this plaque. When the race came near, we weren’t sure if Roger would be able to watch, because he was having more bad days than good. Turned out he was able to make it! That race, the 2009 Capital City Half Marathon was one of the most emotional races I had ever run. Seeing him at the sideline, skinny as a rail, holding up a sign is forever etched into my brain. Roger had been at some of my races before to show his support of my running, but this time it was different, I was running for him! After the race was over I met up with him, his wife, and my husband. During the race I had decided to give Roger my medal to show him that he’s a winner in my book and how much he meant to me. That medal since then had been adoring the mirror on the dresser in his bedroom. If you have followed my blog, you will know that Roger passed away almost two weeks ago from a second battle with NonHodgkins Lymphoma; one that he was not able to win. Today, my mother in-law gave me the medal I had given to Roger. It was an emotional moment for me, because when he tackled cancer a second time, I was hoping that he’d walk away a winner again. To me, receiving the medal back made it somewhat more final that it wasn’t meant to be. The medal that I really never wanted back will be the one I will treasure the most. It now hangs proudly in my office and as soon as I get the chance, it will go into a shadow box to be properly displayed. The alarm didn’t go off. The husband told me that he set it the night before to go off at a certain time, but we forgot that it only goes off during the week. Luckily my internal alarm clock works just fine and we got out of the house with plenty of time to spare. We picked up my parents-n-law on the way to Columbus. Roger was in a good mood and feeling well. They dropped me off at work and I walked to the Hyatt Regency where the Team was meeting up. The hubby and Co. went to Tim Hortons to get something to eat before standing outside for several hours. We all (the Team) met up before the race in a conference room, had some refreshments, a team picture, and then walked together to the starting area. I stood in line for the port-a potty and then worked my way towards the starting corral part that matched my projected finish time. The weather was great! After about ten minutes of people watching the gun went off and the ‘race’ was on. The first 2 miles flew by. I ‘ran into’ a co-worker and we silently ran next to each other for half a mile or so until we got to the first water stop. He was on a mission so away he went. He ended up finishing 9 minutes ahead of me, which was a great accomplishment on his part. But, I kept on trekking. The race actually didn’t become hard until about mile 9. I saw the father-in-law just shortly before that. He had made a sign for me. (I was running in his honor). At mile 10 I saw some friends from MiT that cheered me on and then a co-worker and his wife at mile 11. That was such a nice surprise and really lifted my spirits. Shortly after that one of the TNT coaches ran with me for about a ½ mile. While we were running a couple came up behind us and the guy said, “Give my best to Roger.” He had read the sign on the back of my shirt “Running 4 Roger”. I told him that I would do that for sure and thanked him. The coach knew I would have no problems finishing the race so he turned back to help some other TNT members. The last mile was tough, but it helped that I saw the family again about a ½ mile before the finish. I was not able to kick it in, but I knew that I would not be completely dead afterwards. I finished in 2:29:05 (my goal was 2:30) and received my medal. I walked to the TNT tent and received my 13.1 TNT pin from a Leukemia survivor, which was really touching. I then went to find my family and gave my father-in-law my medal for him to keep. I had been debating on giving it to him then or to wait until his chemo therapy was done. But, I thought that it would mean more to him getting it now. He was very touched and I was glad he was able to watch me run. 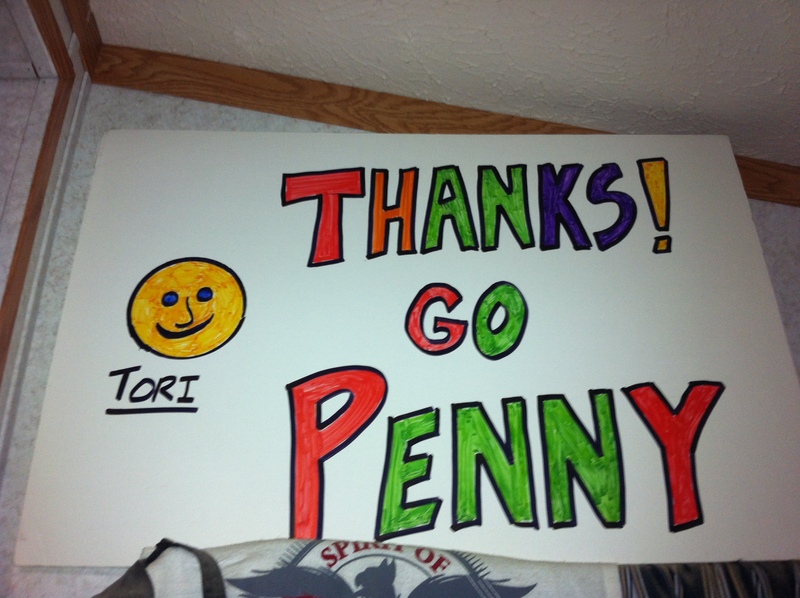 Overall it was an emotional experience, from raising the money to running the race. 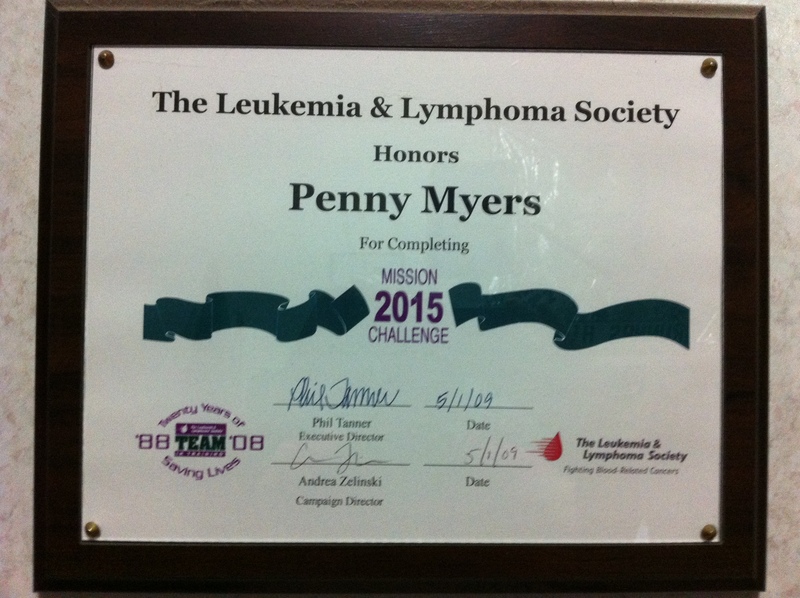 I ended up raising over $3100 and received a plaque from the Leukemia and Lymphoma Society honoring my efforts. I am glad it is over, even though my worrying about Roger will continue for months. However, just like in the race, you charge forward one step at a time. I have already decided which race is next on my agenda; the Spirit of Columbus ½ marathon August 30th. This will be my 10th ½ marathon!!! The schedule is written and training will officially start after we come back from vacation. I am looking forward to our yearly trip of a week of quadding at the Silver Lake Sand Dunes. There will be no running for me this week. I did get on the bike today and everything felt fine. My left foot is still sore underneath and I will get me a new pair of Saucony’s before I go back out again on Saturday. My legs just have a trace of soreness, but that should be gone by the time I go out and run. Did we just do 4? Comments: The TNT group run was at Sharon Woods today. I’d say about 20 people showed up, which is about the norm. A and I stretched a bit and were off. Going by our time on Wednesday (12:44 min/mile) I would have assumed we’d be doing a 12 min mile or so pace, but after the first mile is was evident that we would be going faster. I kept trying to run just a little behind A, so she could determine the pace. She was like a loaded pistol. We covered the first mile in 10:44. The second mile was a little slower because she needed to tie her shoe. The third and fourth mile put us at an average of 10:59, a much faster pace than 12:44! The loop was only 3.8 long, but I talked her into finishing out the 4 miles, which she did! Our fundraiser at a bar last night netted us $83.25 each (there were 4 of us). Not bad for 4 hours worth of work and a ton of fun! The fundraiser at the running store wrapping presents for donation this afternoon netted us $2 each…haha, less than the $4 I made last week; granted though the girls before us made $53 each. I guess it was just bad timing on our part. With my ‘donut’ money (bringing donuts to work for donations every Wednesday and donating the money for the donuts as well) I am just about ½ way to my obligatory $1500. Wo-hoo! When I first signed up to run for Team in Training I did it because I thought it would give me a sense of accomplishment when crossing the finish line, knowing that I just tackled 13.1 miles and help raise money for a very worthy cause. I never really thought that it would become very personal for me. Today, this morning, my father in-law, whom I adore, respect, and admire (I am unable to convey to you with words how much I really like that guy! ), was diagnosed with Lymphoma. Here is a man, who has always been on the go, be it hiking the Appalachian trails, going quadding with us, working on things around the house, or horsing around on the floor with his grandkids, now always tired and just not able to do the things he once enjoyed, and not because of age. The result of the biopsy was just a preliminary one. We do not know what kind of Lymphoma he is tackling, but we are all glad that we now know what is wrong and that a battle plan is in the works to get rid of his cancer. We do know that Lymphoma has a high “cure” rate and we keep that in mind when our thoughts drift. It is a strange coincidence that I am training with the Leukemia & Lymphoma Society’s Team In Training this season, but now I am fully able to appreciate them. I posted this not to solicit money, but rather to use it a bit as an outlet, because I do worry about him very much. Thank you. Comments Off on It hits home! Comments: Saturday was cold, today was wet. I am not sure which one I prefer. Ran without an iPod today, forgot the headphones at home…oops. The run was good, felt a bit slower than usual, but I did not push it. The payoff was no side stiches. That was nice. I did a bunch of stretching afterwards, to keep after my goal of stretching 4 times a week for at least 10 minutes. One down 3 to go. I have raised $449.75 out of the required $1500 so far. I should be satisfied with that, but for some reason I feel the need to meet the goal next week. Talk about putting unnessecary pressure on myself. I count my blessings to have some very generous co-workers! The fundraiser at the bar is on the 19th instead of the 12th. The date is not the best, but we will work with what we have. In case you would like to stop by it is from 5 to 9pm at the Lodge Bar. Hope to see you there! Comments: I am certainly not a fan of tempo runs, but I do realize that they are very helpful in regards to performance improvement. It was cold out again today, but 12 degrees warmer then yesterday. When I stepped outside I was worried that perhaps I had overdressed, but once I started running down the path the wind was blowing quite a bit. Had our Team in Training Kickoff meeting yesterday. Several speeches were given, including that by a blood cancer survivor and a doctor that treats blood cancer patients. We learned about our Hero, a 13 year old girl that was diagnosed with Leukemia in ’06 and after some radical treatment is now in remission. It was all very touching and makes me realize how lucky I am. In order to make my running more of a challenge and give it a deeper meaning I have commitmented to running the Captial City 1/2 Marathon for/with Team in Training, which is know for its fund raising efforts to fight Leukemia and Lymphoma. My pledge to The LLS is to raise between $1,500 to $2,000 by April 8th. I am currently waiting to receive the information to set up my my personalized website to accept donation. Once I do I will update this post. I am looking forward to this challenge and hope you join me, motivationally and financially, on my quest to help people in need, while doing something I enjoy.